The Nielsen Company recently released data on smartphone usage, and there were some very interesting results. Overall, 29.7 percent of U.S. cell phone owners now own smartphones. The most popular smartphones, not surprisingly, are the iPhone and Blackberry, which both have around 27 percent marketshare in the U.S. 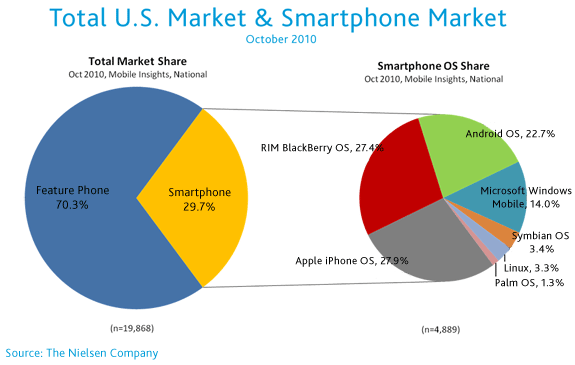 But Android is catching up quickly, with nearly a 23 percent marketshare. 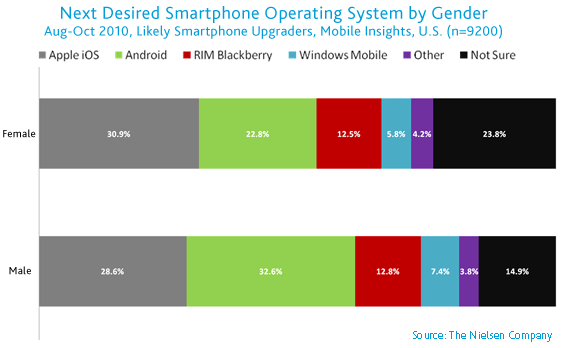 When it comes to which mobile operating system people desire for their next phone, Apple’s iOS and Android were tied. But there was a distinct difference between the sexes—women want the iPhone and men want Android. Nielsen's survey didn't provide any data for why this may be the case. Though I would speculate that Apple has successfully positioned itself as the "lifestyle" solution, which appeals more to women's tech buying habits, and Android has becomed positioned as the techie alternative. And it's true that Apple still offers a better selection of apps, while Android phones offer more technical features. Feel free to chime in with your thoughts. By the way, in the interest of full disclosure, I use an Android phone and my wife uses an iPhone. Go figure. I’m going to have to disagree with your conclusion. Based on these stats, there’s only a 2% difference between men and women who want the iphone. The big difference is really between android and undecided. The 10% increase in men’s desire for Android is matched almost completely by the 10% higher unsure rate in women. Draw your own conclusions about that. Bah - don’t listen to him… he’s feeling emasculated because he has an iphone. @Steve Fair enough! Would love to hear YOUR conclusions about that. I’m a woman, have a windows phone before, change to android and now on my second android, i love android and my next phone will be android, I’m already buying Apps so when I migrate from phone to phone I will have my apps. Writing this on my android. my conclusion…Women are much more thoughtful in their decision making, spending quality time weighing the pros and cons of each device before committing. We men have less patience, and want the newest coolest thing yesterday. hmm. I started this thinking it was going to be slightly sarcastic, but now that I reread it, I think it’s probably true. Erica waited 4 months after I bought my Moto Droid, only to buy the much nimbler Incredible. I agree with Joe’s comment about Steve. No man wants his decisions compared to those made by women. And just because you take longer to make a decision doesn’t mean you make the right choice. When it comes to tech stuff, men can make quicker decisions than women because they typically have a better background in new technology, and can therefore skip the research that many women must do to get to where a man starts. I like the Android because of the open platform open to all. I have to question these statistics. I am a woman and I own the Droid phone, as do 2 of my female co-workers. I only know of one man in my office who owns an iPhone. I’m wondering if Nielsen’s survey was limited by other factors such as location or occupation. The main reason for preferring Android is that the Verizon network is much more reliable and women care about whether their calls get through more than what games they can play. I think people are over-analyzing things… women are more likely to want the iPhone because it’s fashionable. Ads explain why men like Android? Android commercials were non-stop during nfl games this season. Maybe this swayed men’s votes and preferences towards the Android?